After years of writing and producing well-regarded sci-fi features like 28 Days Later and Dredd, author Alex Garland made a name for himself as a director with 2015's Ex Machina, a tense, often horrifying look at humanity’s ever-evolving impulse to destroy itself (with a little assist from technology, to boot). Now, Garland’s gearing up for his follow-up to the Oscar-nominated film, teaming up with Natalie Portman and his old star Oscar Isaac for the “nature run amuck” thriller Annihilation. 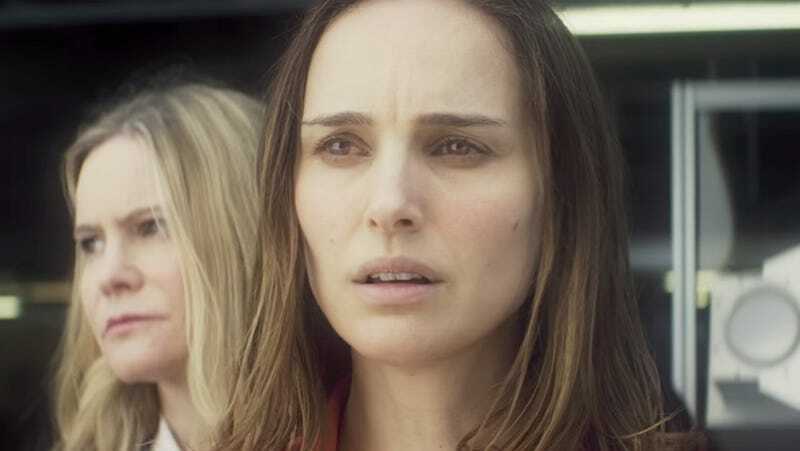 Portman stars as a biologist who ventures into a bizarre-but-lush scientific anomaly in order to figure out what’s happening to her comatose husband (Isaac). Accompanied by a team that includes Jennifer Jason Leigh, Tessa Thompson, and Gina Rodriguez, she’s forced to battle both the mutated creatures lurking in the zone and its creepy effects on the human mind. Will she go crazy? Will she get eaten? Most of us will have to wait until February 23 to actually find out. But not you, dear readers. (The ones living in Chicago, at least.) We’re offering free passes to an advance screening of Garland’s new film, set for February 21 at the AMC River East 21 at 7:00 p.m. All you have to do to score your tickets is head here and click “Get My Passes.” Be sure to arrive early, though; advance screenings, like evolution itself, are a tricky and competitive beast, and you don’t want someone else stealing your spot on the food chain because you accidentally showed up late.